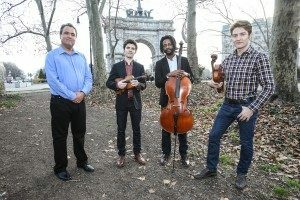 Recognized around the world for its unique blend of classical string quartet literature with jazz improvisation and rhythms, the Turtle Island Quartet will bring its “Birth of the Cool” concert to Jussi Björling Recital Hall, Friday, September 16 at 7:30 p.m. as part of the Gustavus Artist Series 2016 concert series. Tickets for the concert are available online at gustavustickets.com or by calling 507-9330-7590. Tickets to see the internationally-renowned string quartet are $15 adults, $11 seniors/non-Gustavus students/Gustavus faculty & staff, and are free to Gustavus students with their student IDs. The Turtle Island Quartet gained critical and commercial acclaim for its blend of the traditional string quartet performance with jazz rhythms & improvisation soon after it was formed in 1985. This style, not explored by quartet players since the medium was created over 200 years ago, came to include bluegrass, funk, be-bop, Latin American and Indian classical music. They were also recognized for their renditions of jazz standards such as Night in Tunisia by Dizzy Gillespie, Stolen Moments by Oliver Nelson, and Dave Brubeck’s Blue Tondo a la Turk. Their evolution as an ensemble has brought them to produce over 20 recordings, Grammy nominations in Best Classical Compilation, Instrumental Composition and and 2 Grammy awards in Best Classical Crossover. The Gustavus Artist Series is delighted to bring the Turtle Island Quartet and Birth of the Cool to the Gustavus campus and its audience. TIQ’s concert will begin at 7:30 p.m. on Friday, September 16 in Jussi Björling Recital Hall. Tickets for the concert are available online at gustavustickets.com or by calling 507-9330-7590. Tickets to see the internationally-renowned string quartet are $15 adults, $11 seniors/non-Gustavus students/Gustavus faculty & staff, and are free to Gustavus students with their student IDs. The box office will open one hour before concert in the concert hall lobby.